On June 3rd, 4th, 5th, 6th, 7th, and 8th, 2014, the Twitter feed @DidMetsLose2Day posted “Yes,” “Yes,” “Yes,” “Yes,” “Yes,” and “Yes.” The June 8th post also included an emoticon of a monkey with its hands over its eyes. This image, and its implied message of “I can’t bear to watch anymore,” perfectly captured what it’s like to be a fan of a team in a six-game losing streak. A monkey covering its eyes is a more appropriate mascot for the Mets than Mr. Met himself. I joined Twitter to follow posts from writers, sports insiders, comedians, magazines, news outlets, and my town’s farmers market. My older brother then told me I should try tweeting. He said it would be fun. So I did, once every few weeks, when something I thought was clever or insightful popped into my head. Then my older brother said I needed more followers. He said it was no fun to tweet if you only had a handful of followers. I googled how to get more followers. The most consistent advice in articles that shared tips on how to get more followers was “follow other users.” If you follow ordinary people and are willing to read their ordinary posts, they will be inclined to follow you and read your ordinary posts. My favorite thing about the @DidMetsLose2Day feed is that there is no semblance of a person behind the feed. On very rare occasions, the “Yes” or “No” answer will be appended by a one or two word hashtag commentary: “#SeriesSweep,” for example, after a “No,” and “#ThankTheUmps” after a “Yes.” The first twenty or so posts I saw had no such appendages, though, and I wondered if the feed was the result of a computer algorithm. Once I learned that a human was doing the posts, I found the feed even more enjoyable for its complete selflessness. Currently, @DidMetsLose2Day has 2390 followers. Every tweet – “Yes” or “No” – is favorited and retweeted by some of these devotees. I tried to reach out to the person behind the feed. I sent him a tweet, asking him to follow me, so I could direct message him some questions. There was no response. In retrospect, I think I would have been disappointed if there had been a reply. It never once crossed my mind that the feed was posted by an anti-Mets fan, someone who reveled in Met losses. 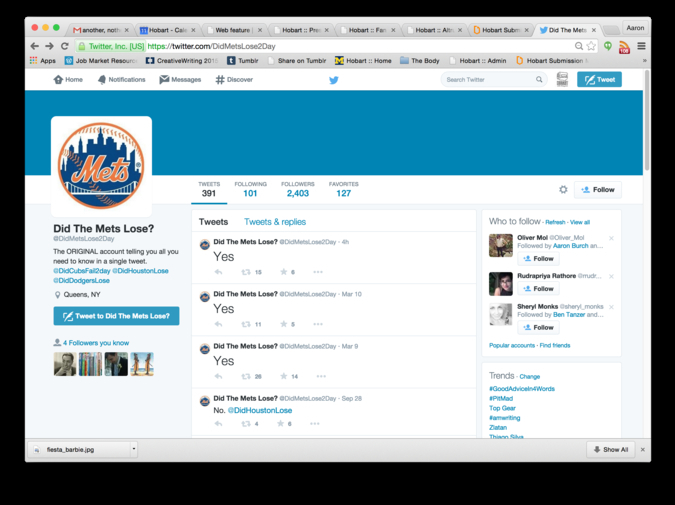 Nor did it cross my mind that the people retweeting the “Yes” posts were doing so to ridicule the Mets. The monkey with its hands over its eyes is the only time @DidMetsLose2Day used an emoticon last season. If the Mets were a better team, I’d watch more of their games, and I’d read more about them on espn.com and nytimes.com. Still, as a fan, I need to know the outcome of each game. I need to know – whether it’s just before I go to sleep at night or when I’m sitting on the toilet in the morning – if my team won or lost. Someone recognized that need, someone who knows that fans like me can’t cover our eyes. The last tweet posted by @DidMetsLose2Day in 2014 was on September 28, the last day of the regular season. The tweet, thankfully, was “No,” but it was more than just “No.” It was “No. @DidHoustonLose.” So, in the end, there was some chestiness, as the New York sports media might say, from the feed. Indeed, the Mets finished the season on a good note, taking two of three games from the Astros. Our best pitcher is expected to return in 2015. Some of the young players – the Dudas, the Wheelers, the deGroms, the d’Arnauds – proved their mettle in 2014 and gave the fan base hope that 2015 could be an amazin’ season. A season with more “No” than “Yes” tweets. Andrew Bomback is a physician and writer. He is the author of You’re Too Wonderful To Die, a novel, and Chronic Kidney Disease and Hypertension Essentials, a textbook. His essays have recently appeared or are forthcoming in Hobart, Essay Daily, Harlequin, For Every Year, Pharos, New England Journal of Medicine, and Journal of the American Medical Association.